OVER HERE AT TheJournal.ie headquarters we sometimes get sent in really, REALLY random stuff. We used to post some of the weird stuff that got sent our way, and we’ve recently started bringing back the randomness. One reader got in touch with a picture of a bee that they fed some honey to, saying the bee “wolfed it down” before flying out the window again. 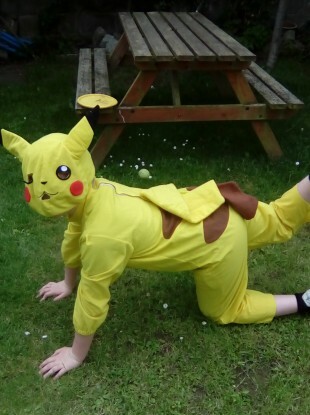 Another reader got in touch with a photo of their son dressed as a Pokémon. We also got in a snap of some Pokemon Go inspired donuts. Yum. This cute donkey also made the cut with a photo being sent in from Lecarrow, Roscommon. Admittedly without shame I’m sending this. I’m done with him and Trump reminds me of Katie Hopkins! Email “Here are the weirdest and most brilliant pictures sent in by our readers”. Feedback on “Here are the weirdest and most brilliant pictures sent in by our readers”.